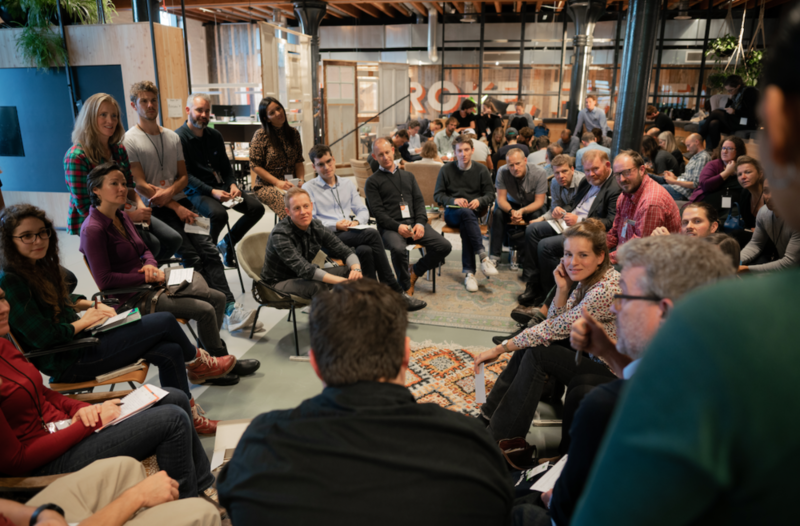 On Thursday, November 15, we were thrilled to host our first annual European Summit at Patagonia Europe headquarters in Amsterdam. With more than 100 member representatives from 14 countries in attendance (that's 14 countries represented out of the 16 countries that we have members in! ), our global movement came together for a full day of learning and discussion to explore how, together, we can address our planet's most significant challenges. 1% for the Planet CEO, Kate Williams kicked off the day by spotlighting the tremendous growth the European network is experiencing and by encouraging everyone to consider how we work together to double the size and impact of our European network over the next two years. Françoise LeMarchand, keynote speaker and Co-Founder, NATURE & DECOUVERTES, spoke of her experiences as a lifelong entrepreneur and how much of her success derives from her and her husband's shared commitment to environmental sustainability. Grounding her business decisions in inspiration taken from nature has been a touchstone in an incredibly successful career and has helped to inspire both her customers and her employees. As Francoise said, "1% for the Planet is 100% for our children." Our first panel, "Creative Giving for Greatest Impact" was moderated by Georgia Phillips, Senior Partnerships Manager, Pukka Herbs. The panel opened with an overview of Pukka's approach to partnerships and how 1% for the Planet assists her in creating meaningful and powerful relationships with nonprofit partners. She also mentioned how it contributes to a deep values-driven company culture. Panelists from our nonprofit network included Hugo Tagholm of Surfers Against Sewage, Marie-Noelle Keijzer of WeForest, Nicholas Bornstein of Protect Our Winters - Switzerland, and Dawn Bettering of Fossielvrij NL - a chapter of 350.org. Much of the conversation explored what type of support can drive the most impact for nonprofits, with many good points describing the importance of long-term sustainable partnerships, the power of corporate communications, and the value of volunteerism. Our second panel, "Power of Authentic Storytelling" was moderated by Steph Pomphrey, Co-founder, HUCK Magazine, who set the context for the discussion by describing how important good storytelling has become in a world where we are inundated with marketing messages every second. Our featured panelists included Madelyn Postman of Leidar, Jari Salo of Jari Salo Design, Natasha Harden of Rebel Kitchen, Matt Pycroft of Coldhouse Collective, and Ana Rodrigo of BiolageSpain. The discussion covered topics that ranged from influencer marketing, to establishing the right goals and audience for creating the most impactful stories, to the authenticity that comes from talking about legitimate nonprofit relationships, to how good design and imagery contribute to the impact of a story. James Whittle and Tom Caulfield of The Tempest Two, a lighthearted duo who insist on eliminating the word "can't" from one's vocabulary, provided some mid-afternoon inspiration. They recounted, with great humor, their experience of rowing 3,000 miles across the Atlantic with absolutely zero experience in rowing. Or sailing. And they were completely unaided. Since this experience, they've gone on to accomplish other great feats, with more to come. Next up was Mihela Hladin Wolfe, Director of Environmental Initiatives at Patagonia, who spoke to supporting grassroots organizations and Patagonia's shift to take a stand on political issues. She also invited colleagues to take the stage, who all offered thoughtful insight on their respective roles at Patagonia. Together, they evidenced how the company's long-standing 1% for the Planet commitment impacts their work regardless of what role they play. We closed the afternoon by breaking into three smaller groups that were co-led by 1% for the Planet staff along with members, Lars Riis of ELSK, Piotr Kowalczyk of Re_Set, and Richie Graham of Richie Graham Photography. We solicited feedback from members about what they would like to see from the 1% for the Planet movement in future years and we discussed ideas for how to grow it. All in all, amazing ideas and enthusiasm were shared and it was obvious that people were eager to get to work collaborating with one another to create a healthier planet for all of us. Ryan Gellert, General Manager of Patagonia Europe kicked off happy hour by sharing a few inspiring words about Patagonia's involvement with 1% for the Planet. We were honored to have been hosted at their office and would like to extend a huge appreciation for everyone who contributed, including our speakers, panelists, moderators, and donors for our goodie bags! This wouldn't have been possible without our lead sponsors, Zwitscherbox and Kind, our meal sponsors Spectrum and MOJU, and our supporting sponsors Wholegrain Digital, Leidar UK, Glo-Ed Travel, Innovation Visual, and Austral Thinking. We can't wait to see everyone at the 2019 European Summit! Stay tuned for details.